View of the Carriageway Condo looking toward the northwest at the U-shaped building. The fire was at the center of the ‘U’ and winds fanned the fire from northeast to southwest. The building is positioned on an angle to the cardinal directions, North, South, East and West. Nozzles are quiet while firefighters (not shown in photo) performed an interior attack. 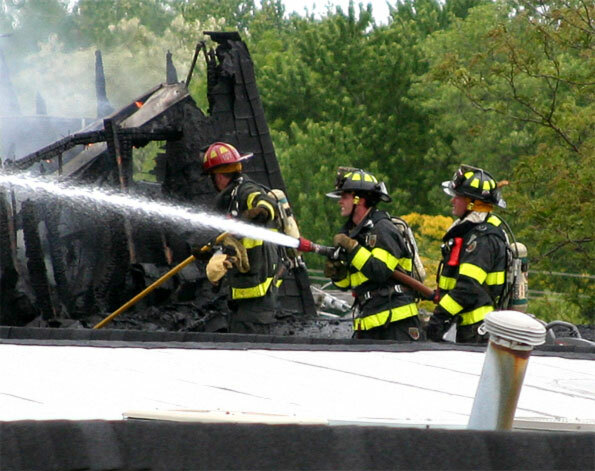 Often Engine Companies attack the fire with hoselines from the inside if the building is deemed safe enough. Truck companies, also inside the building, pull down the ceiling with pike poles and look for fire toward the roof — above the ceiling. 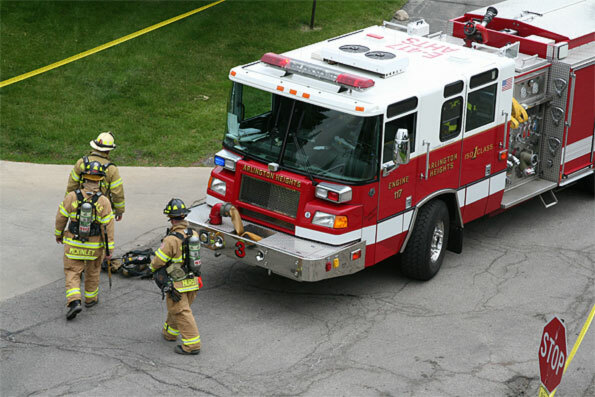 Other truck companies douse the fire from above and operate the Tower Ladder, which is the truck with the elevated platform, a hose nozzle and firefighters in “the basket” or platform. 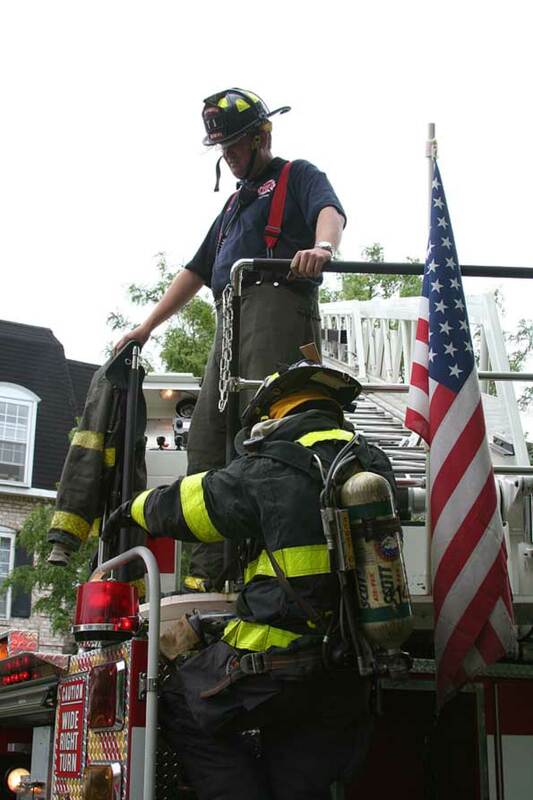 During the Carriageway Condo fire, Mount Prospect Fire Department’s Tower 13 crew kept a close watch over the roof and could see interior firefighters working below as they peered through holes in the roof. The nozzle is quiet in the above photo because the water pressure is too high to aim it down into the building while firefighters are working below — the pressure would knock them down or cause flying pieces of roof to hit them. 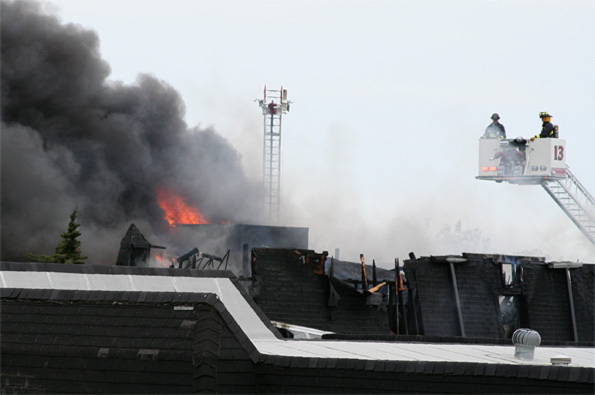 The interior attack method of firefighting is preferred because it might use less water at lower pressure, so less water damage occurs to adjacent units and to units below the burning units. 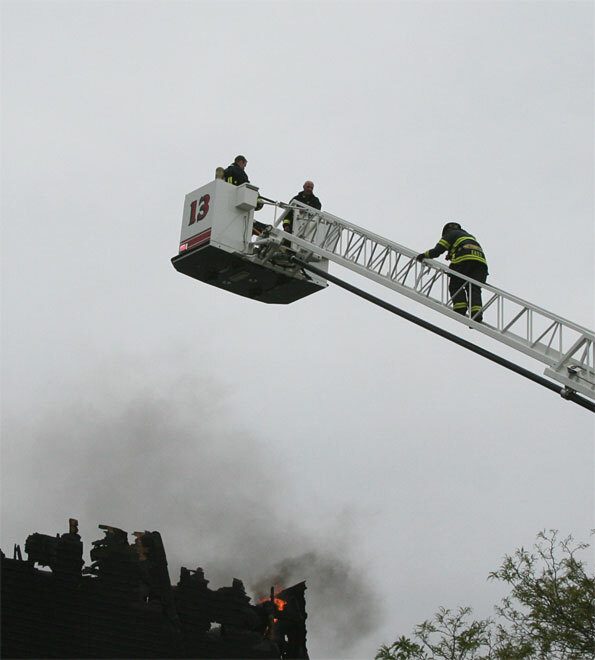 With their nozzles quiet, Tower Ladder firefighters watched from their vantage point for safety issues. They could see a flare up of the fire above the interior firefighters, unknown to the firefighters inside. That was about the time when thick black smoke started up a second time. A roof ventilation unit also seemed perilously close to collapsing on some of the firefighters, so they were ordered to back out. With interior firefighters ordered out of the immediate area, the Tower Ladder crews turned up the water and hit the fire again for a final knockdown. Schaumburg’s Truck 52 hit the fire from the south, Arlington’s Ladder Tower 1 hit the fire from the east, Rolling Meadows Fire Department’s Quint hit the fire from the northwest, and Mount Prospect’s Tower 13 hit the fire from the north, to finish off the major flames. Then the interior teams went back to work inside. Since the fire was upped to a 4th-Alarm, plenty of fresh crews were able to relieve working crews. Wood Dale firefighters, possibly a fresh crew, walk past Arlington Heights Fire Engine 3. Mount Prospect Tower 13 in its position on the north side of the condominium on Carriageway in Rolling Meadows. Arlington Heights Tower 1 crew hitting the fire with a hose attached to the Tower Ladder platform. 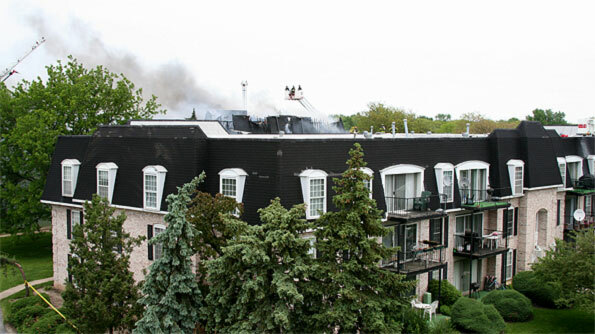 The Arlington Heights crew was also seen cutting the roof for ventilation. Climbing down off of Arlington Heights Fire Department Tower 1 after a hard day’s work.